As the weather heats up during the summer, there is hardly anything more refreshing than a chilled beverage! Perhaps you are on the lookout for a new mojito recipe to try now that it’s the season of backyard parties and pool days. Most of us have sampled Starbucks’ passion fruit tea at one point or another, but have you tried making your own passion fruit drink? 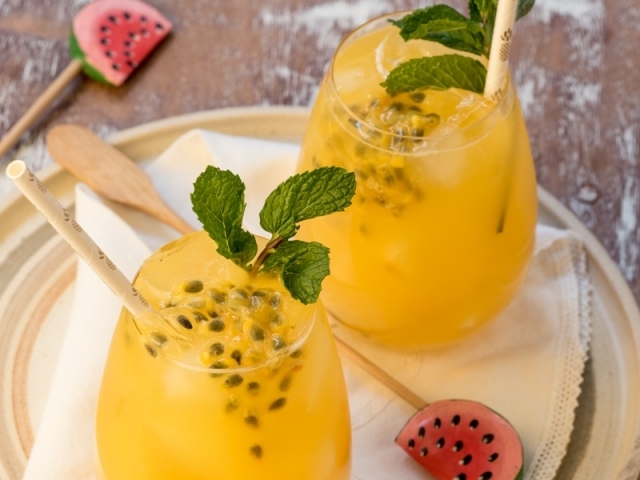 This recipe explores the tropical sweet flavors of passion fruit, combined with a slight tartness of lime and the balanced spice of ginger to bring something extra fun to the table. With the addition of a bit of sugar, the fizz of soda water, rum, and a mint leaf garnish, your guests are sure to be impressed with these drinks! 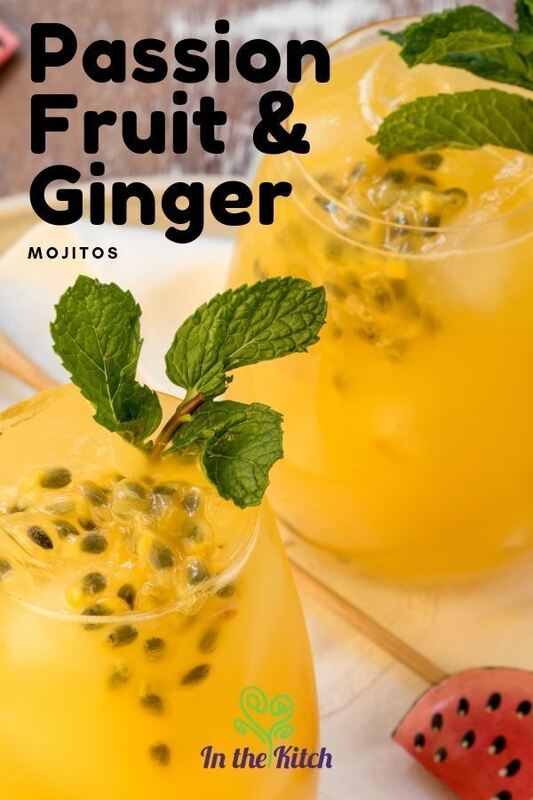 This recipe explores the tropical sweet flavors of passion fruit, combined with a slight tartness of lime and the balanced spice of ginger to bring something extra fun to the table. With the addition of a bit of sugar, the fizz of soda water, rum, and a mint leaf garnish, your guests are sure to be impressed with these drinks! Cut passion fruits in halves and scoop out seeds and pulp. Pour the pulp and seeds in a fine metal strainer over a mixing bowl. Use a wooden spoon to push as much of the pulp through the strainer, leaving the broken seed pieces behind, to form a puree. Combine sugar, passion fruit puree, ginger powder and lime juice in the bottom of a pitcher. Pour the rum, ice and soda water over top and stir gently to combine. 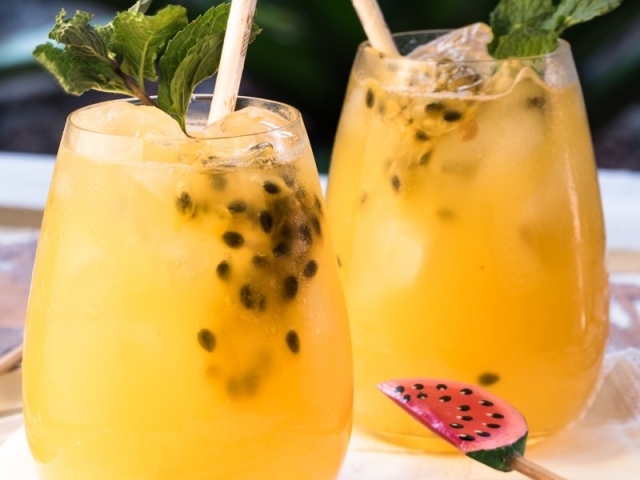 When ready to serve, divide the mojitos between glasses and top with extra mint leaves and passion fruit. With only a few steps and about twenty minutes of effort, you’ll have a unique and refreshing beverage prepared and ready for your guests. This recipe is simply bursting with flavor and even better, it isn’t a hassle to prepare. 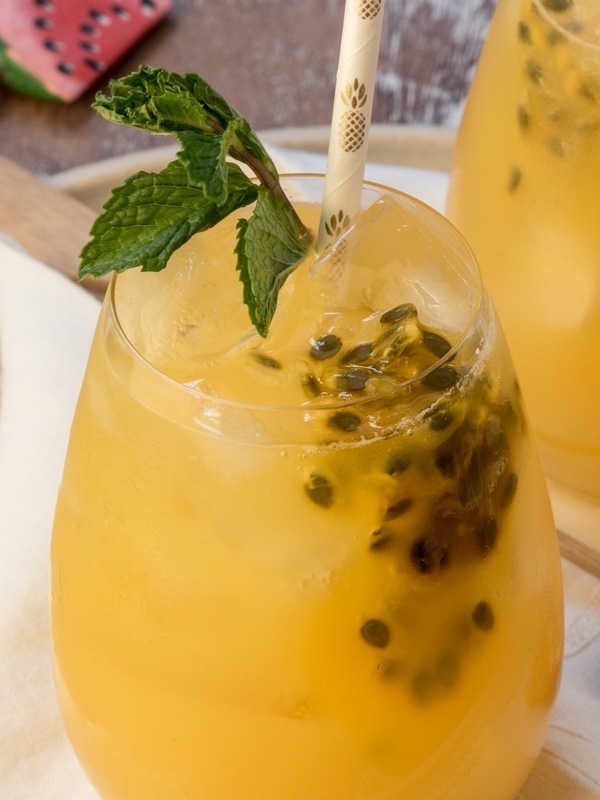 The most effort you’ll need to invest in this drink is merely in scooping out the passion fruit pulp and straining it for the puree. At that point, you’ll simply mix the puree with sugar, ginger, and lime juice, and then pour the rum and soda water over top. Add ice to chill it and garnish each glass with mint leaves! This would be the perfect adult beverage for when you’re craving a little extra kick on a hot summer day. Have you tried this mojito recipe or perhaps a similar one? We’d love to know what you think in the comments and please feel free to share the recipe with your friends and family if you enjoyed it.